This set of retro slideshow templates will be appreciated by those who value classic elegance. 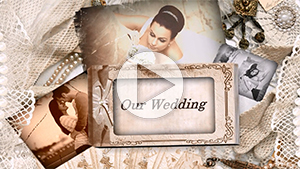 It's a perfect base for a keepsake movie featuring a love story, engagement, wedding, or family memories. The slide styles have a delicate design inspired by vintage scrapbooks. Old paper backgrounds, antique picture frames and floral embellishments bring the spirit of the past alive and evoke sentimental feelings. The designer also used black & white photo filters and subtle animation to add to the nostalgic mood. Eager to create your own retro slideshow with this style pack? Then download the templates to your SmartSHOW 3D software and get started! All you need to do is to choose the pictures for each slide. There are slide styles for both landscape and portrait shots, so you can use absolutely any photo from your archive. Don't forget to add your captions to slides with text, and pick a soundtrack - moderate paced music works best. Finally, export the slideshow to a video file or burn a DVD to share your sweet memories with family or friends.